On Saturday, February 8, from 10 am until 5 pm, celebrate Frederick Douglass’s 196th birthday in this celebration of the life of this great orator, abolitionist, and statesman. Hear music from the Civil War era from the Washington Revels Jubilee Voices, see demonstrations of a Civil War soldier’s life and weaponry, enjoy fun activities for kids, and learn more about the role of African American soldiers in the Civil War. 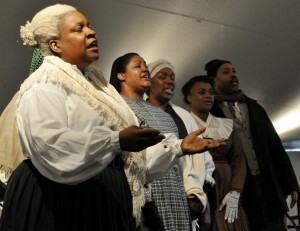 Jubilee Voices performs at 10 am during the Opening Ceremonies at the Anacostia Playhouse, 2020 Shannon Place, SE, before the gathering processes the half-mile from there to the Douglass House). For more information about the event, go to Frederick Douglass National Historic Site, 1411 W Street SE, Washington, D.C.